We’d love your help. Let us know what’s wrong with this preview of Bees in Loretta's Bonnet by Lois J. Wickstrom. When Loretta dropped her armload of firewood on the hearth, a mysterious tube fell from between the logs. It was a leafcutter bee nest. Loretta took it back out to the woodpile and watched as holes appeared. But where were the bees? She found more holes appearing in leaves on her rose bushes. And even some of the rose petals. But where were the bees? Leafcutter bees are more When Loretta dropped her armload of firewood on the hearth, a mysterious tube fell from between the logs. It was a leafcutter bee nest. Loretta took it back out to the woodpile and watched as holes appeared. But where were the bees? To ask other readers questions about Bees in Loretta's Bonnet, please sign up. Leafcutter bees are more efficient than honey bees for pollinating gardens. The book includes instructions for building a nest that may lure wild bee When Loretta dropped her armload of firewood on the hearth, a mysterious tube fell from between the logs. It was a leafcutter bee nest. Loretta took it back out to the woodpile and watched as holes appeared. But where were the bees? Leafcutter bees are more efficient than honey bees for pollinating gardens. The book includes instructions for building a nest that may lure wild bees to your yard. Loretta's curiosity leads to discovery in this delightful illustrated children's book. Written on about a third grade level, this would be appropriate as either a read-aloud to your kids, or a relatively early reader for your young school age kids. There's also a science project for constructing a leaf cutter bee nest at the back, a great resource for a nature project for classroom or homeschool. This is a children's book, and there's nothing offensive in it. Unless you don't like life on a farm, or bees. Personally, things that sting tend to be low on my list of friendly pets, but the leaf cutter bee is mild, and rarely stings unless handled. Also, their poison is milder than that of say the honey bee. They can damage prize rose bushes, so they are sometimes considered pests. Bees in Loretta's Bonnet is an educational look into the life of the leafcutter bee and its contribution to life on a farm. There are clear instructions on how to create a nest for these relatively docile creatures, as a project for the kids. It's well illustrated, with watercolor pictures on every page. Science projects are always a plus, and having one at the end of an entertaining illustrated children's book is a great combination. The instructions for building a leaf cutter bee nest are clear, and make for a great family project, whether your kids are homeschooled (like mine) or whether you are teaching a classroom. I've seen the inquisitive nature of kids in my four, and it's refreshing to see a girl who enjoys learning about bugs and their contribution to life. Five Stars! ‘Bees in Loretta’s Bonnet’ is a delightfully informative book aimed at children between three and eight years, by American author Lois J Wickstrom. Not feeling qualified to review this work alone, I enlisted the help of someone of appropriate age. Noah already knew about quite a bit about bees but enjoyed the story and particularly liked the interactive section in the final third of the book. The subtlety of the title was lost on him, but parents who read the book with their children will appreci ‘Bees in Loretta’s Bonnet’ is a delightfully informative book aimed at children between three and eight years, by American author Lois J Wickstrom. Not feeling qualified to review this work alone, I enlisted the help of someone of appropriate age. Noah already knew about quite a bit about bees but enjoyed the story and particularly liked the interactive section in the final third of the book. The subtlety of the title was lost on him, but parents who read the book with their children will appreciate it. At 34 pages it was possible to finish the book in one session, as there were a lot of pictures. We read it electronically and sadly the artwork didn’t convert well in this format. However the cover design was appealing and Noah liked it. This book conveys information in an enjoyable way which will encourage children to learn about the life-cycle of the leafcutter bee. At seven, Noah is towards the upper age limit and his interest was definitely stimulated, so much so that we had to find out as much as we could afterwards about the leafcutter bee which is presumably what the author had in mind. The vocabulary is age appropriate and Noah managed to read the entire book himself. I note that the author has written several other books about insects and will definitely look out for them in hard copy form for Noah’s younger brother, but Noah said he would have preferred a slightly more complex story. Nonetheless, ‘Bees in Loretta’s Bonnet’ is an engaging book and we award four stars. So, before I begin I must say that I am not at an age where I am 'qualified' to read children's books....but we're very welcoming on CommonBookSense, so I review them anyway ('sides, it's not like there's a 5 year old running a book review blog...who am I kidding, this is the internet. 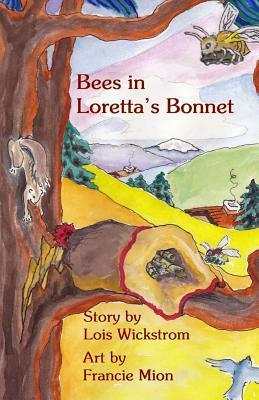 Bees in Loretta's Bonnet is an easy to understand children's book. I can see it being in elementary school libraries. I especially liked the little how-to at the end. I can see teachers usin So, before I begin I must say that I am not at an age where I am 'qualified' to read children's books....but we're very welcoming on CommonBookSense, so I review them anyway ('sides, it's not like there's a 5 year old running a book review blog...who am I kidding, this is the internet. Bees in Loretta's Bonnet is an easy to understand children's book. I can see it being in elementary school libraries. I especially liked the little how-to at the end. I can see teachers using it in their classrooms. Personally, Shell and I have enough bees migrating from our bee-keeping-neighbor's yard to keep our non-existing flowers looking spiffy, so I didn't try it...It did look rather simple...again, like you'd see in a elementary classroom....or maybe a biology class. The subject matter is very easy to follow and understand. I think I could have read it in second grade, but I think it'd be enjoyable for kids that're like....six to nine? I don't know, I was reading Harry Potter and Twilight when I was ten (I actually finished both series in a semester, so my A.R. goal was reached within the first week of a new quarter....Go small(er) Kailei! ), so I'm not a proper judge of these things. Overall, this is a good book to get your children if you want them to advance in their reading. I really liked the colorful art work, it tied everything together nicely. As always, all the links will be below! The author sent us a physical copy of this book, so if you would like us to host a giveaway with it, comment on the ORIGINAL post , or our tweet/facebook post! This was quite an interesting little story all about leafcutter bees - and how they end up in Loretta's bonnet. It's full of lots of fascinating tidbits on the bees and it even includes a little tutorial on making your own nest to attract wild bees to your yard. A few grammatical issues took the story down a notch. Using numerals (e.g. "5", "6th", "3/4") instead of spelling out the words is generally frowned upon. This is a fairly small issue overall; however, a children's book should strive for the highest level of grammatical accuracy. Here's where a little professional editing goes a long, long way. Lovely artwork that fit the story nicely. The art reminded me a little of the work of Garth Williams in the Little House on the Prairie series. The style is different, but the artist captured a lot of the same charm. Bees in Loretta’s Bonnet is a charming and educational tale about a little girl who is fascinated by nature and after finding a Leafcutter bee’s nest - learns more about them. I have heard about solitary bees but not a Leafcutter bee and absorbed the beautiful colour illustrations and story keenly, wanting to learn more. I also liked very much the instructions about how to build your own Leafcutter nest to attract bees. I love nature too, so can recommend this book for children of all ages. Bees in Loretta's Bonnet is a cute little children's book that is entertaining and fun but it is educational as well. I'm not exactly a lover of bees but this book taught me the importance of bees and how important they are in nature. I loved the illustrations done by Francie Mion, too! They were very beautifully done. There is also a little "how-to" for building a little nest for wild bees by yourself. This was a nice, quick read :) 4 Stars! *Note: I received a copy of this book from the author i Bees in Loretta's Bonnet is a cute little children's book that is entertaining and fun but it is educational as well. I'm not exactly a lover of bees but this book taught me the importance of bees and how important they are in nature.